Like Merchant Ships: Happy Valentine's Day! 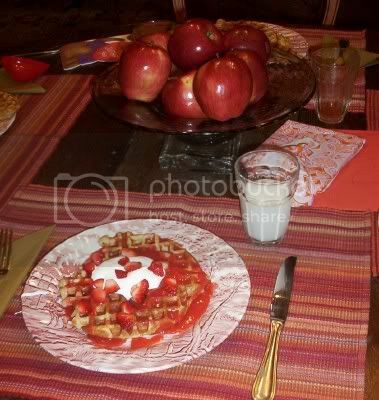 That waffle look so yummy!! Have a Happy Valentines Day also!! Hey, Meredith - I really enjoy reading your blog! We've found Craigslist to be great for selling stuff if you have what people want. We've sold a desk, a bathroom shelf tower,the mattress and bedding, and CD towers just in a couple months! We had the most responses (22 in two days) on the bed), and I think we re-listed the desk before it sold. The biggest problem we've had is with no-shows, or people who commit to coming to look at it and then back out. We've decided that next time, we will put something like this in our ad: "The first person to commit to coming by a certain time today will have first dibs." If you tell the first person that emails you that they can come later in the day or tomorrow, then you might miss out on someone who could come in an hour!